You said YES to the dream God placed in your heart. You might ask, “Now what?” It can be scary to take the first step, so here are 5 practical tips to achieving your dream. First, seeking God’s voice through prayer has to be at the center of your dream journey. Friend, when God made us in His image, He included that same creativity. We can be creative and dream big dreams because His spirit is within us. Have a conversation and brainstorm with God about where to start first. God didn’t give you this dream to send you off alone. Invite Him into the process by asking what He thinks! As I began my dream, there were days when I felt crystal clear about my focus, but I noticed there were times when I felt confused. When those times came, I pressed in, prayed again, and sure enough God would open my eyes and remind me of the goal. Press in at every stage. Next, write down what you hear. What is God speaking to you as you pray over the dreams? What ideas do you have? Has He given specific instructions? 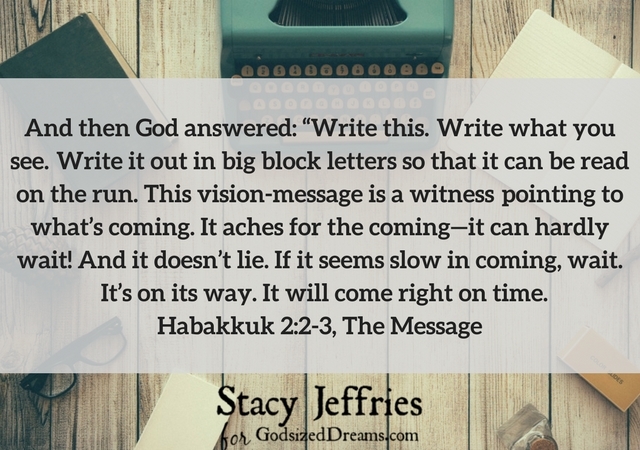 In Habakkuk 2:2-3, we are encouraged to write the vision and make it plain. I love The Message Translation and how it says that the dream can hardly wait, and that it speaks to what is coming. Even the dream itself is excited to be born! We must trust God’s timing, for our dreams will often be a process, not a destination. Keep all of your ideas in one place so that you can review them later. Don’t dismiss anything; some things are for now, while others may be for later. Not a journal person? Use a word document. Write post-it notes and stick them where you can see them. Create a vision board. Place it where you’ll see it often as a reminder to pray. A few months into starting my dream, I was feeling discouraged. I shared my heart with a friend, and she listened and even offered some suggestions. Her support was like a life preserver, and I was thankful for her encouragement. We were created for community, and our dreams are too! Surround yourself with people who encourage you and keep you accountable. Another great tip for starting out is to follow like-minded people and organizations on social media so that you can shift your mindset. Listen to podcasts or take webinars on topics related to your dream. God will bring the right people at the right time to partner with you. Once you have prayed, built your dream community, and taken notes, it’s time to take the first step. Speak to that person. Apply for that grant. Create your website. Whatever it is, do it. God will give you the confidence and boldness to pursue your dream. Waiting on God’s timing is so important, but so is moving when he says GO. Wherever you are on your dream journey, I pray the tips provided here are helpful as you work towards accomplishing your dream. What other great tips have you received? We would love to read them in the comments! Feature Image Photo Credit: CreateHer Stock. Originally from Memphis, Stacy now calls DC her home. This Southern Belle will make you laugh with “it could only happen to her” stories of her everyday life. Once trapped in the comfort zone, she is embracing adventure as Papa calls her out of the boat to meet Him on the water. She has a heart for prayer, missions, youth, and will never turn down a hug. 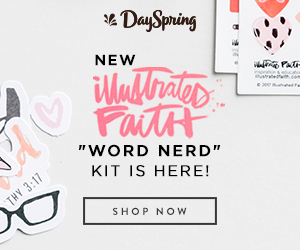 She loves to encourage women with her story, because she knows firsthand that we are loved by a Mighty God who capable of healing broken hearts, if we surrender the broken pieces to Him. She is learning to enjoy sailing with Papa as He makes everything in her life beautiful in its time. You can find Stacy on her blog ,Twitter,Facebook, orInstagram. Thank you, Stacy, for sharing that verse from Habakkuk! It reminds me of God’s words to John in the Revelation, and I can’t think of any better advice to writers than to “write what you see.” Also, Zechariah’s exhortation not to despise the small things — you’ve mined some amazing truth from parts of the Bible that we rarely visit! The passage in Habakkuk has been my rhea for years! Your tips are spot on! I would add to keep repeating them until your dream is fully realized. 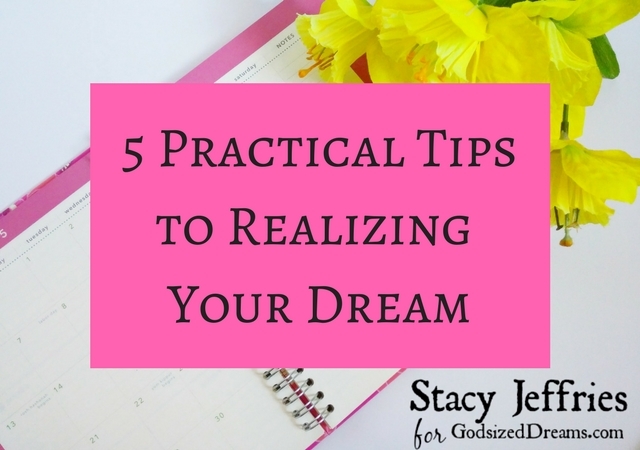 Thank you, Stacy, dreams are a lot of hard work and guidelines and tips help keep us going and help us to measure our progress! These tips will be kept close by as I continue to pursue God’s will and fulfill the dream of being closer to my family. 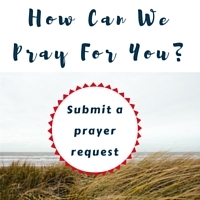 I know it will be difficult to achieve, but I already have the support and encouragement I need, but I need to take action by little steps and reliance on the Lord’s guidance. Thank you for such a timely message.